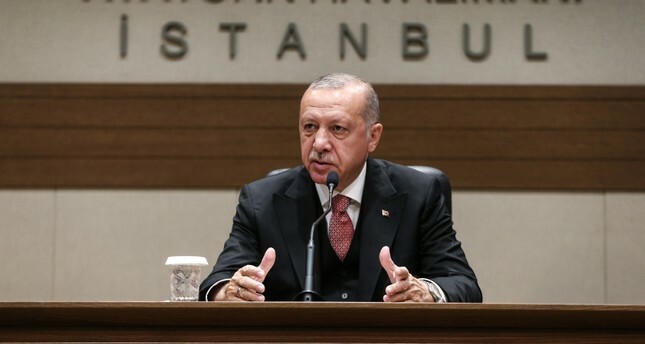 President Recep Tayyip Erdoğan criticized Israeli Prime Minister Netanyahu for his election pledge to annex occupied West Bank territory belonging to Palestinians, saying that everything the country has been doing since 1948 violates international law and U.N. resolutions. "The West Bank belongs to Palestinians, Israel is taking another occupation measure," Erdoğan told reporters at a news conference in Istanbul's Atatürk Airport before he headed to Russia for an official trip. The president noted that Turkey will stand by Palestinians. Polls have indicated a close race, though Netanyahu's Likud Party is expected to have a better chance than Gantz's Blue and White slate to form a ruling coalition. Polls forecast more than 60 out of 120 parliament seats for the Likud and smaller right-wing and ultra-Orthodox Jewish parties. Meanwhile, Erdoğan also said the recent municipal election was almost completely marred by irregularities and that they have found traces of organized crime. While in many provinces election results have been smoothly declared, in Istanbul, where a tight race took place, the case is not the same. There have been reports of irregularities and suspiciously unregistered votes by the parties. The recounting process for Istanbul votes following the appeals is currently underway and the ultimate decision of winner will be declared by the Supreme Election Council (YSK), a non-partisan and independent judiciary body.